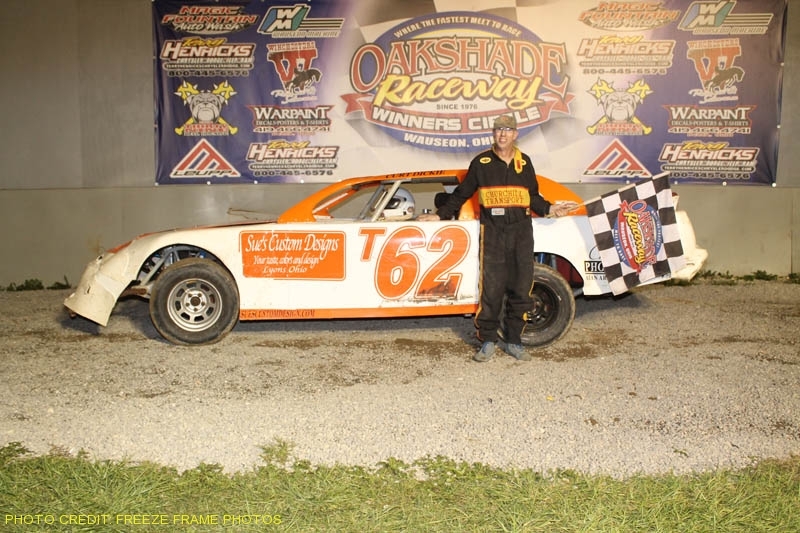 Rick Delong from Whitehouse, OH captured his first Late Model feature win of the year at Oakshade Raceway holding off Greg Martin and Rusty Schlenk. Delong started on the pole and immediately assumed the lead at the drop of the green flag. Greg Martin started directly behind Delong on the inside of row two and began to put heavy pressure on the leader early in the race. Rusty Schlenk, the unofficial Oakshade Raceway Late Model points leader, started 11th and worked his way up to third by lap 14 just behind Delong and Martin. Delong pulled away from Martin during the middle portion of the race, but Martin and Schlenk closed back in near the end. Delong held off the late challenge and went on to win the caution free race. Martin held off Schlenk for second and Rick Green finished fourth. Sportsman rookie driver, Josh Steinacker grabbed the lead after starting on the pole on his way to his second Sportsman feature win of the year. The first yellow flag came out on lap five after Brian Fisher spun in turn two. Chris Keller and Ray Klawitter also had troubles just as the caution came out and both left the race. Another caution on lap 11 for a spin for Rich Noonan would slow the field a final time, but Joe Derbeck who ran second the entire race could not reel in Steinacker’s hot rod. Steinacker stopped on the front stretch after the race for the presentation of the Bill Reckner Memorial trophy and after climbing out of his car, he did a couple of back flips much to the crowds delight. Derbeck finished second followed by Tim Fisher and Mike Jessen. Dan Dippman and Todd Silvey ran close together in the top two positions for most of the Bomber A Main. Just as Dippman would open up a lead, the caution flag would fly. It waved four times during the race, but it was not enough to help out Silvey. Dippman picked up his second Bomber A Main win of the year with Silvey settling for second. Dan Bleikamp, Jim Scout and Bob Gregory were the rest of the top five finishers. Richard Patton and Ben Thomas were the front runners early in the Bomber B Main, but luck was not on their side. Tony Mapes’ car came to a stop on turn two on lap four and the second place automobile of Ben Thomas crashed into the stopped car. After a later caution, Bob Rendel shot around the high side of Patton to take the lead. A few laps later, Kevin Cole slid up into Patton while trying to make a pass on the inside of turn three taking both cars out. Rendel went on to the easy victory with Brad Blonde finishing second. Ted Goetz Jr. started 18th and ended up third ahead of Jeff Foks and Jeff Potridge. Jacob Gamber led the Bomber C Main until a restart after a caution on lap five. Chris Williams and Matt Shipley got beside Gamber going three wide for a moment. A caution for Ron Leonard’s stopped car allowed Gamber to retain the lead for the restart, but Shipley was too strong. Once in the lead, Shipley pulled away from the rest of the field and took the easy victory. Gamber held off Williams to finish second. Tim Zuver and Eric Potridge rounded out the top five finishers. The 16th Annual Barney Oldfield Race paying $4100 to the UMP Late Model feature winner will be held Saturday, June 18th at Oakshade Raceway. Sportsman and Bombers will complete the evening’s racing program.